As we shared in our earlier communications on this topic, we’ve been in active communication with Box since these issues were reported. Given the urgency of the situation, Box is prioritizing work to rollback to an earlier, stable release. The Box team is assessing the details of this now, and based on their guidance, we expect this rollback to happen tonight, February 22nd, Eastern Time. When the rollback completes, we will share another update to confirm the operation is complete. Thank you for your patience and understanding as we continue working to resolve these issues. Your concerns and frustrations are definitely being heard with regards to the critical bugs introduced this week and we're actively working towards a resolution. Since I'm receiving reports of NBV bugs through various channels, I wanted to use this post as the main location to document the individual issues, shared workarounds and provide updates on timing. I do apologize for not having a timeline resolution at the moment, but Box is actively working on providing those to me after additional discussions today. Highlight Tool: When the resolution is low (below 1600*1200), the browser window is zoomed in or not maximized, the highlight tool disappears. Drawings: Once you have added a drawing, the delete tool is missing. Workaround: Submit the assignment to save changes, then go back into the attempt, expand the iframe and THEN you can select drawings to delete them. Comments: When adding a comment, the cursor doesn't automatically appears in the "write a comment" text box. No hardware stylus functions properly (thanks: Amy Eyre and Aderemi Artis) (Was “iPad Pro: Stylus input has stopped working on iPad Pro. While Box categorized the change in display to be more responsive and currently functioning as designed with the long panel showing to the right, there may still be some inconsistencies in the experience. I'm reading through various threads to see if I can tease out any underlying issues. I also wanted to re-share the document Amy put together as others are finding it helpful. Thanks Amy Eyre! New Box View - Staff - "Small Screen" Workaround Guidance - Google Docs. While there are still outstanding issues that need to be solved, the focus right now is tackling any new critical items found with the update this week as quickly as possible. I am compiling a list of any outstanding bugs and enhancements to start tackling next. 2/22 Update: While we don't have timelines yet, I wanted to share an update on the status for a portion of the items. The ability to delete annotations (#2) is actively being worked on by Box engineers. The missing highlight capabilities (#1) and the cursor automatically populating in the text box (#3) are still being investigated further. Regarding the trash bin icon (#5), the current behavior is expected to better match other Box behavior, however they are discussing reverting the current behavior. Thanks everyone for all your comments and feedback to this post so far. I am reviewing all of them to capture additional bugs and feedback for Box. We're happy to announce a new feature in BbStats: Latent Class Analysis with Annual adoption report. Some time ago we reported about a new study at the University of Illinois at Chicago about Patterns in Faculty Learning Management System Use . This research was featured at the DevCon in 2017 and in Top 7 findings in the new study on Blackboard usage . Running your own Latent Class Analysis study may be of interest to you, but likely many priorities are competing for your time. By the way, Latent Class Analysis is a statistical method for identifying unmeasured class membership among subjects using categorical and/or continuous observed variables. So, while we can't run a custom study for you, it is now possible to identify latent groups already documented. BbStats will graph out how many of your courses belong to each latent group. It doesn't do that by running the model itself, you would do that in order to discover new latent groups or groups unique to your organization. So, as long as you accept the findings of the UIC study, BbStats will identify three documented groups in your data. Latent group analysis is a process of grouping data to discover new patterns. In a way, the data itself speaks to you through the emerging patterns. Extracting the course design data from Blackboard with BbStats and running the statistical model at UIC identified the following groups: Holistic, Complementary, and Content Repository. Course data was extracted from 2562 courses with 98,381 student enrollments during the Fall of 2016. A latent class analysis was conducted to identify the patterns of LMS tool use based on the presence of grade center columns, announcements, assignments, discussion boards, and assessments within each course. Three latent classes of courses were identified and characterized as Holistic tool use (28% of the courses), Complementary tool use (51%), and Content repository (21%). 1. Count all courses with an active grade center. According to the study, this includes Holistic and Complementary courses, but excludes Content Repository courses. 2. Count all courses with an active grade center, announcements, and discussion forums, which identify the Holistic group, with very close approximation. 3. Identify all courses accessed by students, which indicate courses that were active at some point in history. Holistic courses = All courses with an active grade center, announcements, and discussion forums. There are two ways of running the Latent Class Analysis report in BbStats. 2. The second way of using the new report is to run the Annual Latent Class Analysis. This will show academic year breakdown based on course creation date from March 1, 2013 to March 1, 2018. The assumption is that courses are created prior to the Spring/Summer term after March 1. This report does not require any course_id patterns (Figure 3). Try it in your staging system. OCELOT: BbStats. The system expects that courses are created inactive and instructors enable courses for students to see. This means that if students access courses, these courses are active. Also, any new gradebook column counts as usage of the gradebook. So, if all new courses are pre-populated with gradebook columns, the complementary category will be very high. However, if faculty create their own gradebook columns by copying courses and if inactive courses are not available to students, the graphs should be accurate. The top findings from the Patterns in Faculty Learning Management System Use | SpringerLink research study at University of Illinois at Chicago. 1. On-line courses at UIC focus on holistic use of LMS tools. 68.3% of hybrid/elearning courses, as opposed to in-person courses, were in this latent analysis group and used five key tools: content items, grade center, announcements, discussions, and digital assessments. Only 22.5% of in-person courses were found in this group. 3% of hybrid/elearning courses were in content repository group. 2. 53.7% of in-person courses at UIC were in complimentary usage group. This means they used three main tools: grade center, announcements, and assignments. In-person courses split 22.5% as holistic and 23.7% as content repository courses. Content repository courses used content items and announcements (without the use of the grade center, assignments, or digital assessments). 3. Holistic group of courses had courses of larger class sizes and greater likelihood of on-line delivery. 4. Comparing the student use of time in digital content of courses and faculty design intentions, there is clearly a gap. Perhaps time spent on course items by students reflects their best judgment on what will make them successful in the course. Faculty may be designing opportunities for students, which are not well communicated and utilized. Further research is needed to bridge this gap and match student digital behavior with faculty expectations and their design for learning. 5. The aggregate profiles of courses by school or college often reflect a general nature of the programs and curricular approach. The adoption of specific tools in the digital portion of a course should not be correlated to academic quality of the program or effectiveness of instruction. This approach reports only on the selection of tools in Blackboard Learn portion of the course design. However, this presentation of the results may suggest resources that may be needed by specific colleges, such as assigned instructional designers or instructor training sessions in specific Blackboard tool use. Finally, as the body of knowledge about the Scholarship of Teaching and Learning (SoTL) continues to increase, exploring the tool use in the local learning management system may help to distribute SoTL findings to instructors and colleges according to the digital evidence of their course design (Englund, Olofsson, & Price, 2017; Openo et al, 2017). 6. The findings in this study need to be related to the patterns, which were identified previously by measuring the student use of courses across a large data set (Whitmer et al., 2016). That study did not report on the faculty intent, in terms of the design of the course, but on the time students spent consuming content. The present study adds that while students may be spending a large amount of time in the content of the course, at least 28% of courses at UIC were created with well-rounded opportunities for students to engage in assessments, discussions, announcements, assignments, and reviewing grade postings. This affects approximately 31,417 student course enrollments (706 courses with 44.5 enrollments on average out of the total of 2,562 courses with an average of 38.4 student course enrollments). The definition of the Complementary group in the study by Whitmer (2016) included content with announcements and the use of gradebook. Our study identifies a different course design profile as Complementary tool use. It includes digital assignments for roughly half of the courses. Perhaps the time required to complete the assignments cannot be recorded in the student activity data; however, there is a clear intention on the side of faculty for students to submit their assignments through the LMS. Along with the Holistic tool use profile of courses, they make up 79% of courses at UIC. 7. The use of the Blackboard Learn system as a “Content repository” makes up only 21% of the system, 3% of hybrid/elearning courses. This latent class profile, content repository, may represent initial phases of a faculty member digitizing a course experience. It may represent the view of the role of technology in teaching as faculty-to-student communication and content-to-student communication. Certainly, this intent by faculty does not tap into student-to-student communication, digital collaboration between either faculty and students (assignments) or student-to-student collaboration (groups, discussions), or digital assessment (quizzes or exams) in the system. It may be that these teaching and learning dimensions are facilitated in the classroom or in other systems. Last week we had an email avalanche when a teacher sent an email by a personal learning desiger rule. The idea was to send a personalized email to every student. The rule was simple: send an email at a specific date and time. The email contained the token ((student_firstname)) and was sent to all users in the course with the role student. This apparently created 400 emails, one for every student, that were all sent to every student, making 160000 emails. Expected behaviour was: send one email to every student. We now realize that he should probably have sent the email to 'Triggering user', but it's not evidently clear that including the token is actually a trigger. Or is it? Maybe you can clarify this for us. It would be nice to have a preview feature for PLD, maybe even a warning when a user tries does something that would trigger so many emails: "You will be sending 160000 emails! Do you really want to do that?" I was going to start a discussion and solicit feedback, then I realized I could just as easily create a blog post and have the discussion in the comments section. So here we are. Part of staying on top of my work is keeping up with Known Issues in Blackboard. A lot of times, I don't have time to log in to BtBb and look things up, so what I'll do is keep a copy of the Known Issues spreadsheet on my workstation for quick reference. This blog post explains the hows and the whys, and also goes into what I do with the data once I've got it. Log in to Behind the Blackboard and click on the link to Known Issues. Once the Known Issues page is loaded, you'll want to narrow down the results a bit. To do this, click the "Release" dropdown and select your environment. NOTE: There are only two options available, 9.1 and SaaS. If you don't know which of these is applicable to your institution, you probably shouldn't be logging into BtBb in the first place. So as the image to the right will attest, I've selected my release (SaaS), and my Product (Learn) and Article Type (Known Issues) were selected by default when I clicked on the "Known Issues" link from the BtBb main page. Your browser will download the file, and depending on your browser and system configuration, you may or may not be prompted to do something. My machine is so accustomed to me doing this that it doesn't even bother me when I go to download pretty much anything from Bb. Now that the XLS file has been downloaded to your workstation, you're ready to get to work and do all sorts of magical things. So locate that file on your machine and open it in Excel. When you try to open the file, Excel will return an error, indicating that the file format and extension don't match and asks if you want to open it anyway. Click "yes" to ignore the error and open the file. When you open the file (against Excel's better judgement) something weird happens. There's data that resembles a spreadsheet but what in tarnation is all that gobbledegook in the very first cell? That, my friends, is something they didn't teach you at Monument University. When you download the .XLS file, there's a surprise hidden inside. The spreadsheet from BtBb is NOT an XLS file at all, but rather an HTML document with a .XLS extension. Excel can open it and present the data because it’s HTML and it’s laid out in tables, so Excel says “oh. Ok. I can figure this out.” and it goes from there. But because it’s not “real” Excel data, it’s hard to work with (and that’s also why it’s always got that big ugly line of code in the top row). To see for yourself, download the file from BtBb, change the extension to .HTM (or .HTML), then open the renamed file in your favorite text editor or browser. It will look okay, but it’s still not quite right. If you copy and paste that text into Excel, you’ll have a lot of blank rows and your sorts will be wonky as a result. The next section shows here’s how to fix that. Open the HTML document in a text editor (There are tons of them out there. I'm a fan of Atom because it's cross-platform. But I confess, if I'm on a PC, I'm partial to Notepad++). Once you've opened the document, delete everything before the <table> tag. There's a lot. Most of it is in the <script>, which is actually the only thing you need to get rid of, but it's simpler just to get rid of everything rather than look for the start and end of the <script>, especially if you're not used to working with HTML code in a text editor. Now we are left with a document with no HTML heading information. This would be a terrible practice for actual HTML coding, but we're not doing actual HTML coding for publication, we're just cleaning up a mess. Your browser will still read it without issue (browsers are smart like that). If you saved the file at this point and opened it with your browser (or with Excel), you'd see that the garbage at the top was gone. But we want to do something else before we save it. What you can't see in the browser is that there are several <p> elements in the code that would cause Excel to render the data as a blank row. This isn't cool. So you want to eradicate all of these. So... do a find/replace for <p>, replacing each instance of <p> with a delimiter of your choice (I like ; in this instance, but that’s just me). We're not quite done. Now that you've saved the HTML file, open it in your web browser of choice. Magically, all of the extraneous rows are now gone. Now, copy all of that data in the table (the one in your browser) into a blank Excel document. Depending on your computer, it may take a bit, as there is a lot of data there. However, if you check out the Excel spreadsheet, you'll notice that the data is clean and much easier to work with. So save the Excel file, and you now have a copy of the Known Issues saved locally. YAY!! This isn't the end, but it gives you something to work with. The real tricky part comes when you want to make those dates something you can actually use, because at the moment, Excel is treating that data as generic text because it doesn't know any better. If there's interest, I'll write a follow-up piece to this about how to clean up the date data so that it actually means something. I will confess, this is a clunky, labor-intensive method, and I’ll come up with a more elegant method eventually, but for the moment, it gets the job done. 1Okay, it should be noted that while I'm writing this, I'm watching a live Phish concert (on the web, not in person), hence the oddball headers and occasionally goofy tone of the article). All right, so you implemented the Open Photo Roster to show campus photo ids to instructors. This helps with learning student names, managing new faculty anxiety about teaching, and allows proctors validate identities before the exam. However, a question sometimes comes up: What about the pictures of freshmen, now that they are seniors, who don't look anything like their pictures! You are in luck. We implemented image manipulation to age the freshmen photos and simulate how they will look in just 4 years. Ok, maybe not exactly ... we're not there yet. What we added are two additional rosters, which may help faculty see more current photos. The two rosters are Blackboard Avatars and Gravatars. Many schools are allowing students to upload avatars to the My Institution cloud interface. These photos can be useful, and now you can see them in the photo roster. On the other hand, the Gravatar system is very popular in WordPress and other social media. It allows students to associate pictures with their school email address. Instructors can specifically encourage the upload of photos to Bb Avatars or Gravatars to make sure their rosters are complete. The new B2 has two versions: Open Photo Roster, and Open Photo Roster Plus. The Open Photo Roster displays Bb Avatars and Gravatars. The Plus requires custom setup arranged by support@dataii.com. The B2s were tested on local installation, Managed Hosting, and Saas. They work with Original and Ultra courses (Ultra menu setup arranged by support@dataii.com). 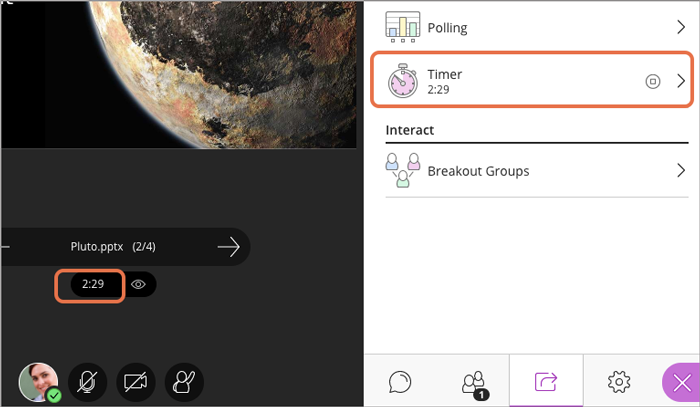 Collaborate Session Timer is Now Available! We are excited to announce that the Collaborate Session Timer is now available! This highly requested feature reinforces our commitment to delivering the teaching and learning workflows that ultimately contribute to several of our product unifying themes including, academic effectiveness and learner engagement. This means that you can now set a timer at the beginning of the session to give students a visible indication of how much time is remaining before the Instructor starts, giving everyone time to prepare for the start of class. Instructors will be able to name, pause, and restart the timer that is also available in breakout groups - you might want to break up the class into several breakout rooms, have them work on an activity for a fixed amount of time, and then bring them back into the main room. With the new session timer, you’ll be able to do that. For more details on this update, please see the Collaborate Ultra release notes.